Survey – What should we do with the Mini Park Port a Pot? The following post comes from Douglas Park Cooperative, who is working with the North Seattle Chamber of Commerce and other organizations to gauge public opinion of the highly-visible Port a Pot in the Lake City Mini Park. Please fill out their survey below as the data will be presented to the Seattle Parks Department. Also, feel free to leave comments on this post. Current location of Port a Pot at the Lake City Mini Park. 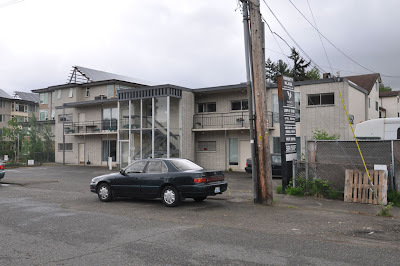 New property acquired by Seattle Parks and Rec on 33rd. The Lake City Mini Park sits in the heart of Lake City’s business district at the corner of 125th and Lake City Way. Visually, the park consists of a paved area, an archway and a Port a Pot. Lake City businesses and property owners would like the Port a Pot to be removed. They cite ongoing health and safety issues associated with it, including public urination and defecation —despite the availability of the Port a Pot in the center of the Lake City business district. Homeless advocates have said in the past that the Port a Pot is the only place some have to use during the night. A survey is being conducted to find out what the Lake City public would like to see happen with the Port a Pot. Both the park and the Port a Pot have a storied history. Please take a moment to familiarize yourself with the Port a Pot’s background before completing the survey. More info about the Port a Pot is below the survey. Prior to 2003, the Lake City Mini Park included a water feature, plantings, and structural features. These provided quiet spaces at a busy intersection. However, they also provided limited visibility. Criminal and nuisance behaviors (drug use and dealing, public inebriation, urination and defecation) were a regular daily occurrence. In 2003, the city spent $340,000 to redesign the park. During the redesign phase, the primary concern was how to reclaim the park from negative behaviors. The city’s solution was to remove all features that blocked visibility – hence the wide concrete open area that exists today. When the park’s redesign was completed, the negative behaviors returned to the park. Lake City businesses documented a significant increase of human feces and urine found on their business doorsteps daily. The business community requested a Port a Pot be installed at the Lake City Mini Park to help end this public defecation/urination. Around the same time, the Mennonite Church (located one block away on 125th) welcomed homeless individuals to use their church property. The Mennonites installed a Port a Pot on their property, but later removed it. The Mennonite Church continued to expand their work with homeless, many with addiction issues. They opened a drop-in facility for homeless individuals near the corner of 125th and 33rd Ave and are currently working with Community Psychiatric Clinic to provide a new and enlarged homeless drop-in facility. Today, the issue of public defecation and urination in Lake City’s business district continues, even as the Port a Pot sits available. 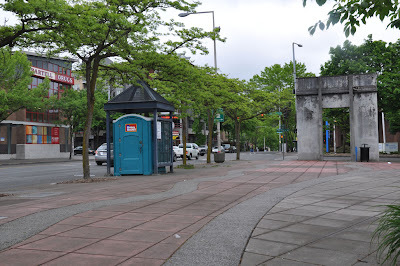 Businesses adjacent to the park report routinely cleaning urine and feces from their properties. Eye witness accounts document open urination and defecation within yards of the Port a Pot, as well as drug dealing associated with the Port a Pot. This entry was posted in Community, Development, News, etc., Syndicated on May 13, 2013 by Lake City Live.